This collection of essays brings together more than twenty experts with diverse professional and geographic backgrounds for a discussion of the Clean Development Mechanism (CDM) and its prospective role beyond 2012. Using conceptual analyses and a series of evidence-based case studies, the authors identify important challenges and opportunities on the path towards CDM reform. Michael Mehling, President of the Ecologic Institute in Washington DC, is one of the book's editors and contributed to several chapters. With a substantial project pipeline and more than 500 million Certified Emission Reductions issued to date, the Clean Development Mechanism (CDM) has rapidly become a central pillar of the international carbon market. While this success testifies to its appeal for investors and project developers, growing criticism has been directed against a number of perceived shortcomings, from disappointing environmental and development benefits to cumbersome approval procedures and flawed governance structures. Each of these challenges, as well as opportunities for reform and improvement, are reflected in different chapters of the book. Additionally, a number of key developed and developing countries active in the implementation of the CDM are described in detailed case studies. Michael Mehling, Amy Merill, Karl Upston-Hooper (ed.) 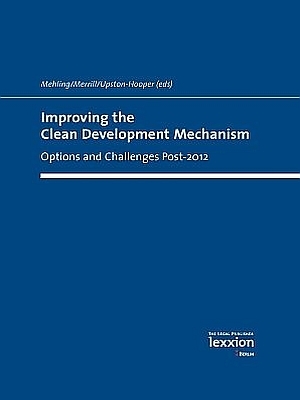 2011: Improving the Clean Development Mechanism: Options and Challenges Post-2012]. Berlin: Lexxion Verlagsgesellschaft mbH.